Other Ingredients: (Sunfiber®) (Guar Fiber), Targeted Release Capsules (Hypromellose and Gellan Gum), Fructooligosaccharides (FOS), Stearic Acid, Silicon Dioxide. 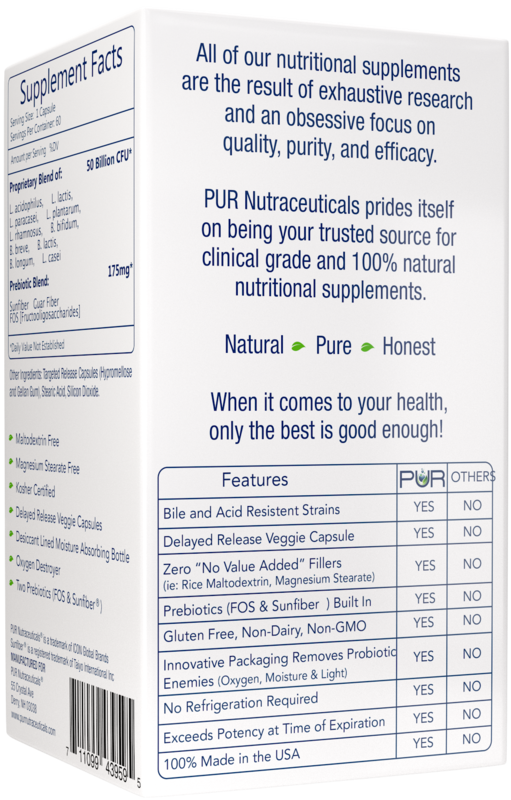 Advanced strength dosage for those suffering from digestive health issues, gastrointestinal discomfort, undergoing antibiotic therapy or restoring a healthy gut microbiome. Proven safe and gentle for long term use. 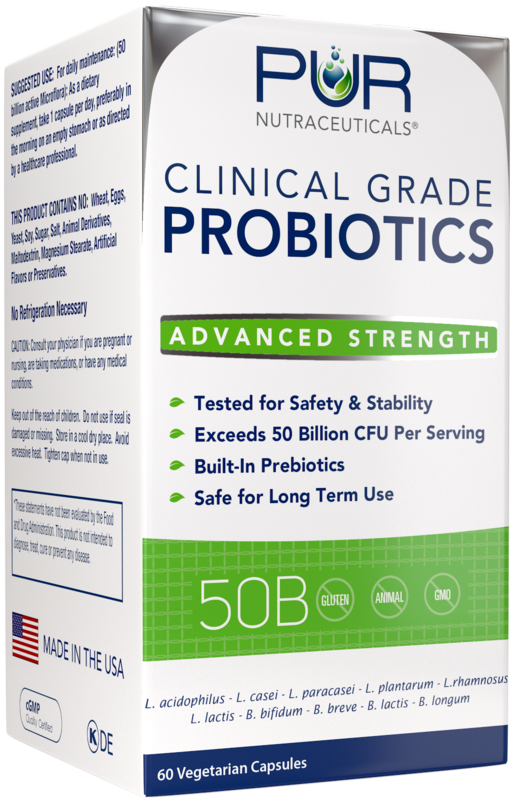 50 Billion CFUs of the following 10 clinically proven effective and allergy friendly probiotic strains: L. acidophilus La-14®, L. lactis Ll-23®, L. paracasei Lpc-37®, L. plantarum Lp-115®, L. rhamnosus Lr-32®, B. bifidum Bb-06®, B. breve Bb-03®, B. lactis Bl-04®, B. longum Bl-05®, L. casei Lc-11®. Prebiotic fiber (Sunfiber®) built-in to each targeted release capsule. 100% made in the USA. Completely pure and free of "no value added" fillers. Vegan, non-GMO and Contains no: Gluten, Dairy, Wheat, Eggs, Yeast, Soy, Sugar, Salt, Animal Derivatives, Artificial Flavors, or Preservatives. 60 Vegetarian Capsules (2 Month Supply). Innovative state of the art packaging removes moisture, oxygen and light. No refrigeration required. 2 year minimum shelf life.